Cooper Webb is in the zone and with four rounds left he’s looking to clinch his first ever 450 Supercross Championship. For the first time ever, the Monster Energy Supercross season is headed to Nashville, Tennessee. The 14th round of the 2019 season is set to be another exciting one. Because the Supercross circuit has never stopped in Tennessee, this will be the first time since 2001 that the Monster Energy Supercross series will be visiting a new state. Nashville will be written into the history books as the 25th state and 47th city to hold a Supercross race. Interesting to note, the Nashville Supercross track map shows that the new venue won’t have a sand section in it’s inaugural event. After four weekends in a row, this will be the first round of Supercross since Atlanta that doesn’t have a sand section. This good news for the many riders who have voiced their disapproval of the sand sections. We are also happy to see a long, sweeping left will be used as the first turn this weekend. The previous 90-degree corners that lead straight into a rhythm section that we’ve seen multiple times this year have been very dangerous. 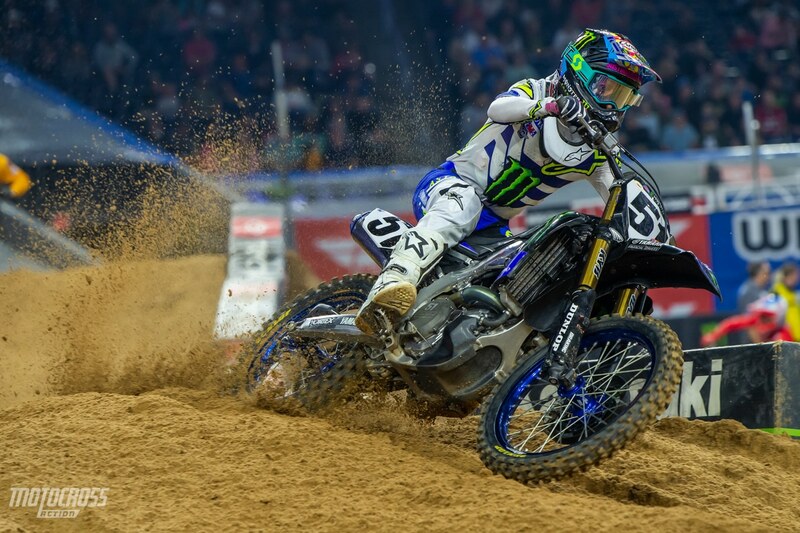 In Houston, the 250 class had a crash in all three of the main events, plus the LCQ. 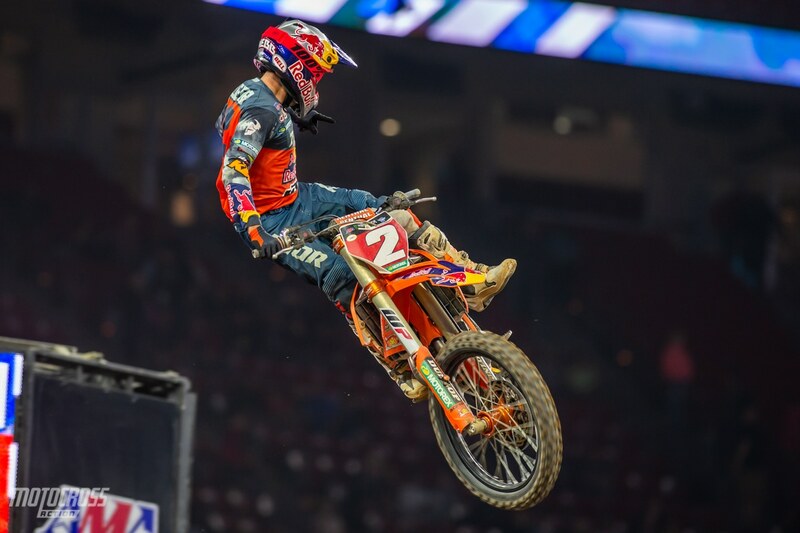 Ken Roczen was also tangled up in a first turn crash that caused him to DNF the second main event. It seems like the industry opinion is split on having sand sections in Supercross. Some love it and some hate it. But we know one thing, it looks cool for photos! Cooper Webb is coming into the new venue with a comfortable 17-point lead over his teammate Marvin Musquin. After a very eventful Houston Triple Crown, it will be interesting to see the two Red Bull KTM teammates and Baker’s factory training partners come together on the track again. We are also wondering how Eli Tomac will respond, we can’t imagine he’s very happy after his performance in Houston and he usually comes back stronger after having a bad race. 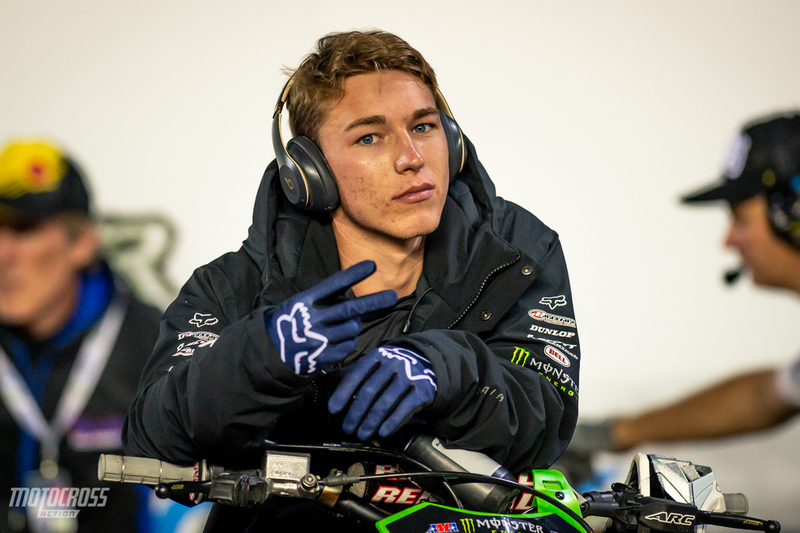 Austin Forkner is the guy to beat in the 250 East Coast Championship. The first ever Nashville Supercross will also be a 250 East Coast round with Austin Forkner, Chase Sexton and Justin Cooper back behind the gate. Coming into round 7, Austin Forkner holds a 26-point lead on Chase Sexton. With a full main event’s win sized points gap on Chase Sexton, Austin Forkner could sit this round out and still be tied with Chase Sexton (if Chase won). But Austin won’t do that. He’s ready to go racing again and he’s looking to add another win to his name. Unfortunately the 14th round of Supercross will not be aired on LIVE TV. The Nashville broadcast will be delayed 3 hours and shown on the usual NBC Sports Channel. If you want to watch live, you’ll need to have the NBC Sports Gold Pass. The plus side of having the pass is that you’ll be able to watch qualifying during the day as well. If you don’t want to buy the $44.99 TV package, no problem. You can stay up-to-date with qualifying results and race results as they happen right here on our website. MXA will keep you in the loop with results, news and photos from Nashville.